Wrapping up an intensive summer, students in the Master’s Industrial Internship Program sat down with 25 companies to showcase their skills and knowledge in an effort to land an internship with one of them. The event kicked off Sept. 10 with a networking dinner where 57 chemistry and physics students got to connect with more than 60 industry professionals. Over the next two days, students took part in more than 425 interviews with 39 interviewing teams from companies ranging in size from start-ups to Fortune 500 companies and national laboratories. As part of the Phil and Penny Knight Campus for Accelerating Scientific Impact, the Master’s Industrial Internship Program offers a fast-track to careers in the areas of photovoltaics and semiconductors, optical materials and devices, and polymer science. The program takes an average of 15 months to complete, and arguably the most intense periods are the interview days. “I feel the same way about the interviews as I do about roller coasters: terrified and exhilarated," said Kim Belmes, a student in the optics track. Those were typical reactions among students as the first day of interviews got underway. Most had seven to eight interviews spread over the two days at the Erb Memorial Union. Industrial partners were looking to hire interns for nine-month, paid positions in myriad technical areas, including research and development, product development, applications engineering, manufacturing, process engineering and defense. Interns work on teams alongside established scientists to make meaningful contributions to current projects. Most will be hired on by their host companies, while some will use the experience they gain to land comparable jobs in the tech sector. The Master’s Industrial Internship Program, along with the Bioinformatics and Genomics Master’s Program, form the Knight Campus Internship Program, which officially launched last year by uniting the two successful efforts. The industrial internship program offers intensive hands-on curriculum, enabling students to excel in industrial and applied research settings while also giving them the soft skills required to thrive in a fast-paced environment typically driven by problem solving in teams. “Most are going from being an undergrad to getting a high-tech, high-paying job within six months, which is amazing,” said Lynde Ritzow, director of recruitment for the Master’s Industrial Internship Program. 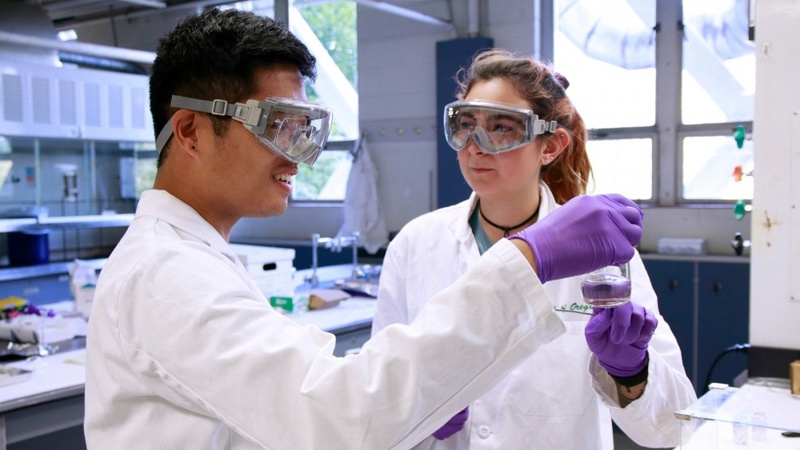 The first three months of the program take place on campus and include focused lab and coursework to help students transition from a college setting to working in industry. That includes professional development and providing lab simulations comparable to what they’ll face once they’re at their internships. “The challenge is to get students to go from being the independent problem-solvers they were as undergrads to problem-solving effectively in teams in an industrial environment,” Ritzow said. Faculty and staff work closely with industry partners to evolve the program’s curriculum and keep students up to date with current innovations in industry. Most students receive internship offers within a few weeks of their interviews and typically start within three months. The program encapsulates the mission of the Knight Campus with its focus on fast-tracking academic science into real applications. The following companies were represented at the 2018 Interview Event: Arclin; Cree; Electro Scientific Industries; Emerald Kalama Chemical LLC; FormFactor; HP; Isovolta; Juno Therapeutics; Lockheed Martin Corporation; Lonza; Los Alamos National Laboratory; McConnell Labs, Inc.; Microchip; Moxtek; Nanohmics; nLIGHT; Ouster; OnTo Technology; Quantum Innovations; Qorvo; Serán Biosciences; Thermo Fisher Scientific; Timbercon; Voxtel Inc.; WR Grace and Zemax LLC.